A helping of Beyond the Darkness, layered with Coast to Coast, and smothered in a thick southern accent. This is a podcast that will satisfy your supernatural taste buds. We tell the stories of haunted places, ghost encounters, cryptid encounters, the paranormal, preternatural, and every oddity imaginable. And we have a few laughs while we're at it! Join your hosts Adam &amp; Matt in their discussions of these topics and email them your thoughts at GraveYardTalesPodcast@gmail.com (mailto:GraveYardTalesPodcast@gmail.com) We thank you for joining us in the GraveYard! 52 - Listener Stories Holiday Episode! This week it’s all about y’all! We tell the stories that you sent in to help keep the tradition of ghost stories told on Christmas alive Tonight’s Sponsor: CARE/OF VITAMINS Takecareof.com promo code: GRAVE Mail us something! PO Box 941 Hendersonville, Tn. 37077 Patreon https://www.patreon.com/GraveYardTales Do you want GraveYard Merch?!?! WWW.GraveYardPodcast.com to get you some! Visit DarkMyths.org Thank You Darron for our Logo!! You can get in touch with Darron for art work by searching Darron DuBose on Facebook or Emailing him at art_injector@yahoo.com Thank you to Brandon Adams for our music tracks!! If you want to hear more from Brandon check him out at: Soundcloud.com/brandonadamsj Youtube.com/brandonadams93 Or to get in touch with him for compositions email him at Brandon_adams@earthlink.net WWW.GraveYardPodcast.com Email us at: GraveYardTalesPodcast@gmail.com Find us on social media: Twitter: @GrveYrdPodcast Facebook: @GraveYardTalesPodcast Sources: All y’all! Tonight we hear from you guys! 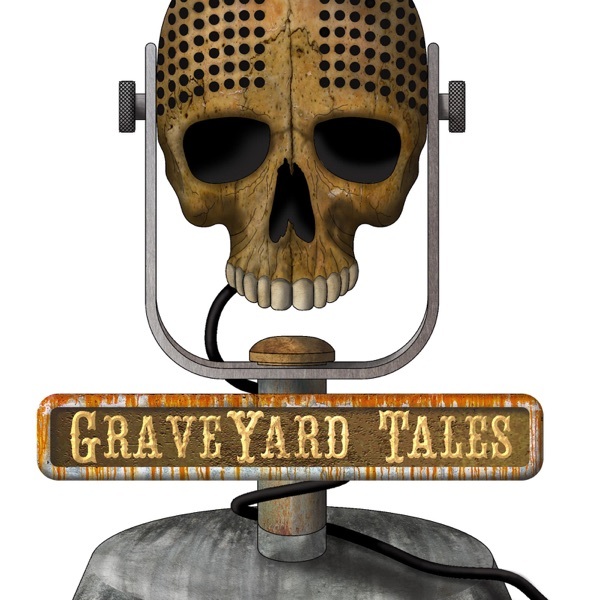 So settle into your casket, get comfortable, and enjoy these listener stories *Poddy Break* Secret Transmission Into the Portal Patreon https://www.patreon.com/GraveYardTales Do you want GraveYard Merch?!?! WWW.GraveYardPodcast.com to get you some! Thank You Darron for our Logo!! You can get in touch with Darron for art work by searching Darron DuBose on Facebook or Emailing him at atart_injector@yahoo.com Thank you to Brandon Adams for our music tracks!! If you want to hear more from Brandon check him out at: Soundcloud.com/brandonadamsj Youtube.com/brandonadams93 Or to get in touch with him for compositions email him at Brandon_adams@earthlink.net WWW.GraveYardPodcast.com Email us at: GraveYardTalesPodcast@gmail.com Find us on social media: Twitter: @GrveYrdPodcast Facebook: @GraveYardTalesPodcast Find us on: Anywhere you get your podcasts!! Tonight we travel different paths! Matt teaches us about what exorcisms are and explains how to tell if we may need a demon removal! And Adam teaches us about Tulpas and how you can create your very own! Join us on our first independent research episode! *Adam’s Jack Russell decided she needed to be heard at the end of the episode so we apologize…. Either that or it was his house ghost* *Poddy Break* Black Picket Fence Our Strange Skies Do you want GraveYard Merch?!?! https://www.teepublic.com/user/graveyard A big thank you to Brandon Adams for our music tracks!! If you want to hear more from Brandon check him out at: Soundcloud.com/brandonadamsj Youtube.com/brandonadams93 Or to get in touch with him for compositions email him at Brandon_adams@earthlink.net Email us at: GraveYardTalesPodcast@gmail.com Find us on social media: Twitter: @GrveYrdPodcast Facebook: @GraveYardTalesPodcast Find us on: Anywhere you get your podcasts!! Sources https://tulpa.io/history-of-tulpas http://www.mind-your-reality.com/thought_power.html http://howtolucid.com/tulpa-guide/ http://anomalyinfo.com/Stories/1929-pre-alexandra-david-neel-and-tulpas-tibet “As a psychiatrist, I diagnose mental illness. Also, I help spot demonic possession”. Dr. Richard Gallagher. The Washington Post . July 1, 2016 “A Beginners Guide to Exorcism”. Austin Cline. www.thoughtco.com. August 30, 2017 “Exorcism Thriving in the U.S.” Href. www.abcnews.go.com. September 11\. 2017 “What Is Exorcism and How Is It Performed”. Fr. John A. Hardon, S.J. www.therealpresence.org. HAPPY HOLIDAYS EVERYBODY! This week we invite you to grab a glass of eggnog or hot chocolate (both with alcohol… cause its the holidays, why not?!) and snuggle up in front of the fire and listen to some scary stories. We asked y'all to send in your favorites because we want to resurrect the tradition of telling scary stories at Christmas! So let's get to it! Here are some of our favorite Listener stories! A big thank you to Brandon Adams for our music tracks!! If you want to hear more from Brandon check him out at: Soundcloud.com/brandonadamsj Youtube.com/brandonadams93 Or to get in touch with him for compositions email him at Brandon_adams@earthlink.net Email us at: GraveYardTalesPodcast@gmail.com Find us on social media: Twitter: @GrveYrdPodcast Facebook: @GraveYardTalesPodcast Find us on: Anywhere you get your podcasts!! No, it's not that Pittsburgh... it's a small town in Tennessee with a ton of ghosts. We discuss all the craziness at this abandoned hospital... and Yes! There is a naughty nurse ghost! Seriously! **Don't forget to send us your stories for our Christmas episode** A big thank you to Brandon Adams for our music tracks!! If you want to hear more from Brandon check him out at: Soundcloud.com/brandonadamsj Youtube.com/brandonadams93 Or to get in touch with him for compositions email him at Brandon_adams@earthlink.net Email us at: GraveYardTalesPodcast@gmail.com Find us on social media: Twitter: @GrveYrdPodcast Facebook: @GraveYardTalesPodcast Find us on: Anywhere you get your podcasts!! I Thought We Were Off This Week!! Yes, technically we are dark this week but we wanted to let y'all know a couple things and to tell you that we need your help soon! A big thank you to Brandon Adams for our music tracks!! If you want to hear more from Brandon check him out at: Soundcloud.com/brandonadamsj Youtube.com/brandonadams93 Or to get in touch with him for compositions email him at Brandon_adams@earthlink.net Email us at: GraveYardTalesPodcast@gmail.com Find us on social media: Twitter: @GrveYrdPodcast Facebook: @GraveYardTalesPodcast Find us on: Anywhere you get your podcasts! !